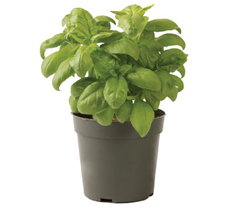 For more information, see our Hydroponic & Container Basil Guide. Note that the containers shown in the images below are all 4" pots. We also offer a printable, PDF version of this chart, which includes a side-by-side visual comparison of all the varieties, for additional reference to relative size. 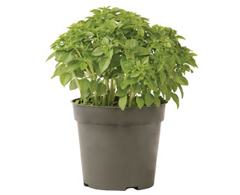 Aroma 2 Popular choice for hydroponic growers because of uniformity and fast growth. 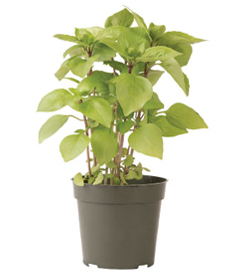 Plants are relatively lanky and sparse, with fewer leaves than more compact types. Leaves are a bit smaller and flatter than standard Genovese. 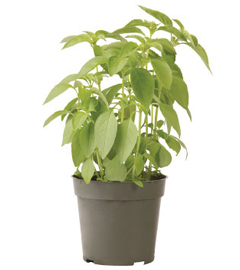 Live plant in container or with growing medium attached. Individual leaf, tip, and bunch harvest, packaged in clam shells or bags. Eleonora Use during times of high downy mildew pressure. Also, fast growing and uniform. Flavor/aroma profile is slightly spicier than traditional Genovese. 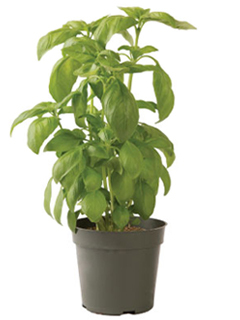 Genovese Recommended only for harvest of individual leaves, stems, or bunches, due to lack of uniformity in plant height and habit. While fuller than Aroma 2 and Eleonora, plants are still relatively lanky and sparse, with fewer leaves than more compact types. Growth rate and plant habit can be variable, making it difficult to use for a dependable harvest of uniform live plants. 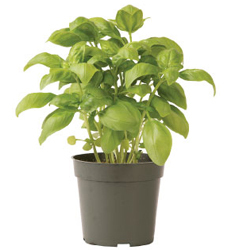 Individual leaves, stems, or bunches packaged in clam shells or bags. Dolly Genovese appearance, with Italian Large Leaf-type yields. Performs very well in containers. 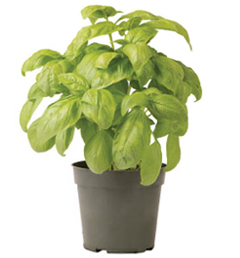 While it is used successfully by experienced hydroponic growers, it is not recommended for those new to hydroponic production because of its sensitivity to nutrient imbalances. Sensitive to nutrient imbalances; often will show zoning/discoloration in leaves more than other varieties, both in hydroponic systems and in the field. Individual leaves, tips, or bunches packaged in clam shells or bags. 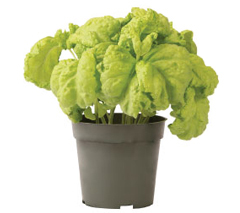 Nufar Popular choice for hydroponic growers because of its uniformity and fast growth. Italian Large Leaf types have a sweeter flavor/aroma profile that is not suitable for markets demanding a Genovese flavor/aroma profile. 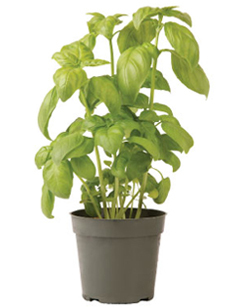 Plant type and flattened, serrated, and rugose leaves are also not as popular as the Genovese type. Individual leaves, tips, or bunches packaged in clam shells or bags. Good for mechanical harvest. 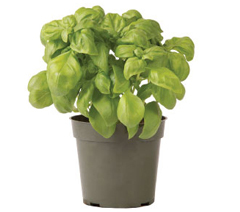 Italian Large Leaf Recommended only for harvest of individual leaves, stems, or bunches, due to lack of uniformity in plant habit. Growth rate and plant habit can be variable, making it difficult to use for a dependable harvest of uniform live plants. Plant type and flattened, serrated, and rugose leaves are also not as popular as the Genovese type. 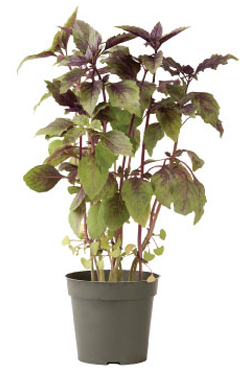 Everleaf Disease-resistant, compact plants, ideal for attractive, full, uniform live plants. 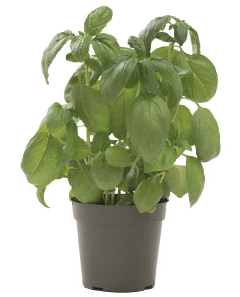 NOTE: Because the plant architecture is so dense, a seeding rate of 2–5 seeds per 4" pot is recommended. If spray treatment is required, it may be difficult to get good coverage on the extremely dense, compact plants. Dense plants are not ideal for bunch harvest. Slower growth rate than fast-growing varieties noted above. Individual leaves or tips packaged in clam shells or bags. 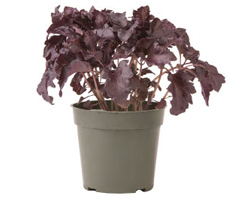 Elidia Compact plants with large leaves are ideal for attractive, full, uniform live plants. Individual leaves packaged in clam shells or bags (a faster-growing standard Genovese is preferable if leaf harvest is primary purpose). 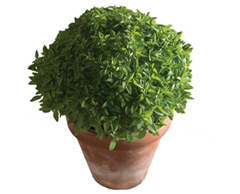 Genovese Compact Improved Full, compact plants with large leaves are ideal for attractive, full, uniform live plants. 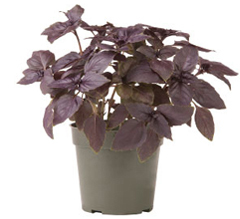 Amethyst Improved Red basil most like Genovese, with shiny cupped leaves. 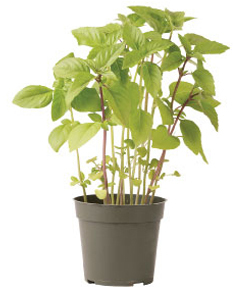 Red Rubin Uniform red basil with sturdy, productive plant habit. 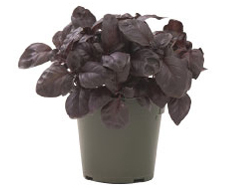 Dark Opal Fast-growing red basil with slightly ruffled leaves. 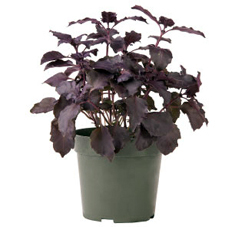 Purple Ruffles Compact red basil with large, ruffled leaves. 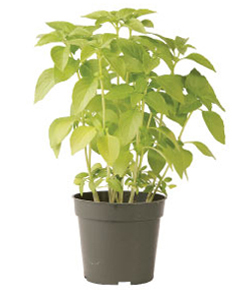 Sweet Thai Popular Thai basil with small, spicy leaves; compact plant. Cardinal Large leaves; compact plant. Cinnamon Large leaves; fast-growing, tall plant. Aromatto Large leaves; fast-growing, tall plant. 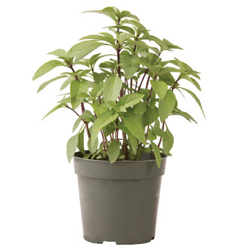 Mrs. Burns' Lemon Vigorous, fast growing; medium-sized leaves. 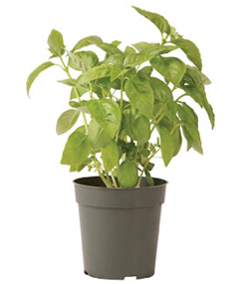 Piccolino 6–8" tall plant; spicy flavor. 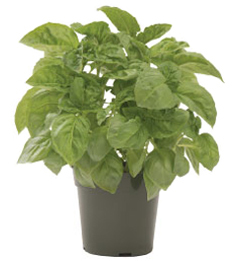 Spicy Bush 8–14" tall plant; spicy flavor. Tuscany Very large leaves; compact plant.